She entered the specialty in 1994 initially because it allowed her to work part-time as a physician and spend time with her husband Paul and their four small children. The family had returned to Mississippi after the couple served six years as Baptist workers in the Horn of Africa. Had the position been full-time, Gay said, she would not have taken it. The HIV specialist and associate professor of pediatric infectious diseases at the University of Mississippi Medical Center said faith has been the defining factor in her life. Gay made international headlines in March for achieving a “functional cure” of a baby born with HIV, a medical breakthrough that could lead to the elimination of the virus in children. As a “functional cure,” the viral presence is undetectable by standard tests but detectable by ultrasensitive methods in the child, who is now 2 years old. In a “sterilizing cure,” all viral traces would be completely eradicated from the body, according to medical terminology. Gay promotes prevention as the best medicine and encourages churches to play an active role in achieving that goal. Gay grew up in a Southern Baptist church, was exposed to Woman’s Missionary Union missions education while still in her mother’s womb, she said, and studied missions from an early age, participating in the Sonbeams children’s ministry, Girls in Action and Young Women’s Auxiliary. Having completed a pediatric residency at UMMC, she went to Africa in 1987 with the intention of teaching at a medical school there. The family returned to Mississippi in 1993 to provide a more challenging education for their children, who were academically gifted and ranged in age from 3-10 years. Gay has long advocated for early, aggressive antiretroviral treatment of babies born to HIV-infected mothers. She achieved the functional cure in a baby whose mother received no prenatal care and was diagnosed with HIV during labor. Gay began the baby on an aggressive three-drug therapy at birth, versus the conventional one-drug treatment, and continued through 18 months of age, when the mother stopped bringing the child in for checkups. “After about 18 months of age, for the next five months, she didn’t return to clinic and when she did return to clinic then at 23 months, her mom admitted that she had not been giving the medicines,” Gay said. Surprised when tests revealed no return of the virus, Gay consulted colleagues at the University of Massachusetts Medical School and Johns Hopkins University School of Medicine, who confirmed the functional cure. 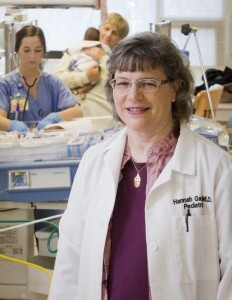 Gay said she continues to be drawn to pediatrics to help children begin making healthy choices early in life. Gay said she intends to continue to focus on prevention, as medical science seeks to replicate the functional cure in other victims. Conventional Thinking: What about ‘gay marriage’?